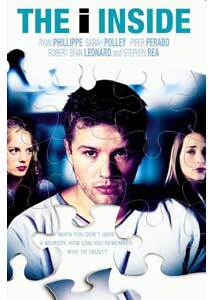 Ryan Phillipe has never been able to get his acting career kicked into high gear. Sure, he doesn't exactly have to worry about putting food on his family's table given that his wife, Reese Witherspoon, commands over $10 million a film, but still, I'm sure he'd like to make a name for himself as well. Unfortunately for Phillipe, 2003's The I Inside wasn't the big breakthrough role he was hoping for, as the film never received a theatrical release in the US and actually premiered on the Starz! Channel in January of 2005 before coming to DVD. Part of the problem with The I Inside is that it borrows far too heavily from recent psychological thrillers, namely Memento and The Butterfly Effect. The film starts off very promisingly, with Simon Cable (Phillipe) awakening in a strange hospital and learning from his doctor (oddly, a pediatrician) that he had died and been brought back to life the night before. On top of that shocking news, Simon learns that his brother (Robert Sean Leonard) died in a car accident, he's been unconscious for two years, and he's married to a woman (Piper Perabo) he doesn't even know. Simon spends much of the film trying to collect his thoughts and determine just exactly what happened to him and his brother and what year it actually is, but director Roland Suso Richter ensures that the viewer has a good time taking this trip with Simon. The key to The I Inside is its pacing, which is always quick, thanks to some nice editing that never gives the feeling that any crucial plot points suffered for its sake. Still, the clichés do pile up, and anyone who is familiar with the aforementioned thrillers won't be too surprised by the proceedings. Despite some flaws and unoriginality, the film is entertaining, not boring or slow. Phillipe does a good enough job working with this material to pull off a convincing performance, depicting a thoroughly confused man who is trying to collect not only his memory but his mind in general. The rest of the cast, including the criminally underused Robert Sean Leonard, are well utilized and as believable as they can be given the material. The ending of The I Inside will remain a mystery to those who have yet to see it, but I will tell you that it reminded me of the ending to another recent DVD release, Dead End. Both that film and this one are engaging yet flawed thrillers that deserve a look now that they're widely available. They would make for a heck of a mind-bending double feature as well. I'm a sucker for twist endings like the one in The I Inside, but this is one of the few times where I could see it coming from a mile away. Still, I found myself wanting to watch it again, right away, and not just to figure things out, but to take this weird journey with Simon Cable as if it was the first time. Image Transfer Review: It's obvious, from the quality of the source material, that The I Inside was originally intended for a theatrical release. Fortunately, Dimension Home Video has used that material to create an excellent transfer that's full of sharp, detailed images and bright, vivid colors. The only real problem is an excessive amount of grain that appears during a few of the darker sequences in the film. Audio Transfer Review: The audio is a Dolby Digital 5.1 track that suits the material just fine and features enough dynamic range to make this an enveloping sound experience. The intense, thriller-oriented music cues come to life from all speakers, and are accompanied by nice bass presence and crisp, clear dialogue that is blended nicely into the overall mix. Extras Review: Unfortunately, there aren't any extras on this disc at all, not even any trailers. The I Inside won't win any awards for originality, but it's hard to believe it didn't receive the theatrical release it deserved. It's well worth checking out now that it's readily available on DVD.